For those homeowners who are tired of the back and forth in yard care and maintenance, artificial grass is the perfect solution. 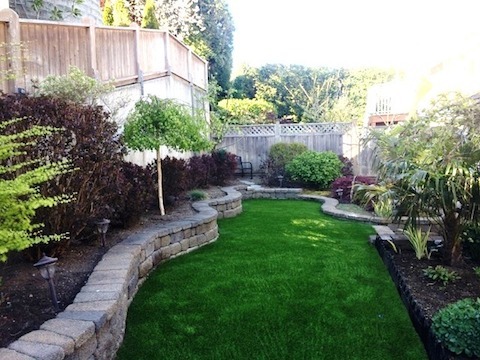 Installing an artificial lawn in Vancouver can put a lot of extra money in your pocket by reducing the need to water, reseed and mow your lawn. Even though an artificial lawn requires far less maintenance to maintain, there are some minimal maintenance requirements to extend its life and keep your lawn looking natural and green for years to come. Follow these tips from the helpful specialists at SYNLawn Vancouver in order to take proper care of artificial lawn. These are the essentials that will help you maintain that vibrant look your lawn came with. Since most of these inexpensive tools can be found easily at any local hardware store, you won’t have to worry about spending a lot of money to obtain them. Once the installation is complete, you will more than likely see an excess of sand on the top of your artificial turf. This is nothing to worry about, since this is normal and you can take care of it by gently sweeping the sand until it makes its way into the infill. To keep your turf clean, you will usually just need a quick once over with the leaf blower to dislodge and remove any dirt and debris that has accumulated. However, once or twice a month, more if you have children and pets, you will want to rinse the turf thoroughly to help dislodge excess pet waste. It’s important to clean up after your pet right away and rinse the area once they have concluded their business. This will ensure that bacteria and odor do not build up. It’s very easy to keep your lawn looking and smelling new. Just rinse the yard frequently and add a mild detergent to clean especially dirty areas where debris and other waste have managed to become lodged. To get rid of unpleasant smells, we recommend you use an enzyme cleaner or a mixture of half vinegar, half water. This will deodorize the area and leave it smelling fresh and clean. You want to make sure that your artificial lawn blades maintain their upright position in order to give it the most natural look. To help with this, use the stiff brush to keep the blades aligned. Avoid using metal brushes, however, as the bristles can severely damage the grass blades. If you have a large installation of artificial grass, brushing the entire lawn may not always be possible. In these instances, you can just brush the areas that receive the most traffic to keep it looking natural. If it appears as if the grass is still bending, just add a bit more infill to perk it up and keep it looking as good as the day you first installed it. Protect your investment by regularly cleaning your artificial lawn. These tips will ensure that your yard will maintain its vibrancy and form for years down the road. Though maintenance is not required, it will keep the area livable and welcoming to you, your family and your friends. Contact us today for your free consultation!